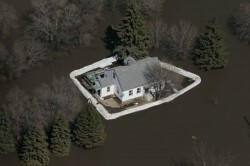 12 Apr 19 - Big real estate firms are pouring resources into calculating climate risk and its likely effect on property portfolios — everything from increasingly extreme weather to sea-level rise. 10 Apr 19 - Patti Poppe used to drive around with an "I Love Coal" bumper sticker, but now the CEO of Michigan-based CMS Energy Corp. is eager to talk about phasing out the fossil fuel. 5 Apr 19 - New York is set to become the first US city to charge drivers a fee for releasing planet-warming pollution from their cars. 2 Apr 19 - A judge's ruling restores former president Barack Obama’s orders putting large parts of the Arctic off-limits to offshore drilling and throws Donald Trump’s oil and gas lease sale plans into question. 1 Apr 19 - Hundreds of US corporate companies have joined together for a renewable-energy alliance. 28 Mar 19 - The US Senate has defeated a motion to take up the Green New Deal, the non-binding proposal spearheaded by progressive Democratic lawmakers. 28 Mar 19 - Around three-quarters of US coal production is now more expensive than solar and wind energy in providing electricity to American households, according to a new study. 22 Mar 19 - In the first significant check on the Trump administration’s “energy-first” agenda, a US judge has temporarily halted hundreds of drilling projects for failing to take climate change into account. 22 Mar 19 - About 70 per cent of fresh produce sold in the US has pesticide residues on it even after it is washed, according to a health advocacy group. 20 Mar 19 - For the first time in years, a broad spectrum of US climate advocates is going on the offensive. 19 Mar 19 - New York City Mayor Bill de Blasio wants to protect Manhattan from climate change by expanding the island’s southern shore to keep rising seas at bay. 13 Mar 19 - The Trump administration's latest budget proposal would radically reduce new spending on federal programs for advancing clean energy. 11 Mar 19 - Across the US midwest, the rise of factory farming is destroying rural communities. And the massive corporations behind this devastation are now eyeing a post-Brexit UK market. 7 Mar 19 - The Trump administration's efforts to undo rules aimed at reducing greenhouse gases would lead to a rise in annual emissions and to thousands more American deaths, says a new report. 7 Mar 19 - Former US coal industry lobbyist Andrew Wheeler is taking over the reigns as the new administrator of the Environmental Protection Agency. 1 Mar 19 - Rising seas have eroded coastal property values from Maine to Mississippi by billions of dollars as buyers pay less for homes in neighborhoods where high-tide flooding is creeping in. 27 Feb 19 - Thousands of workers are assembling an ethane cracker plant in the Ohio River Valley - conspicuous symbol of a petrochemical and plastics future looming across the Appalachian region.